It's that spooky time of year again, so what better pet to cover than a creepy crawly of Argus? This month's pet is red and green so it might give the impression of a different holiday, but we can assure you that its teeth, tusks and spikes are anything but jolly — we're covering the Antoran Bile Larva! The Antoran Bile Larva is from an entirely different planet, which makes it literally an alien insect... that we're bringing back to Azeroth because reasons. Nothing could go wrong there, right? This pet can be found as a level 25 wild pet all over Antoran Wastes on Argus. It can spawn as either the primary pet or secondary pet. Because this pet is from Argus, characters looking to collect the Antoran Bile Larva will need to be level 110 and complete the story quests of the first zone. These quests will take you through Krokuun before you're allowed to travel to Antoran Wastes. 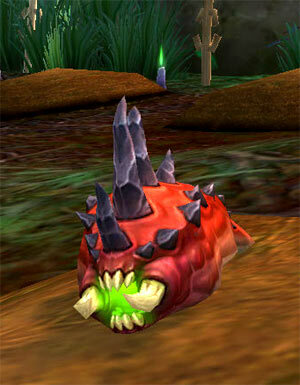 Once you've reached the quest, The Burning Heart, you'll have access to the Antoran Bile Larva's natural habitat. The Antoran Wastes is a dangerous zone full of hostile mobs, many elites, and will periodically have deadly environmental hazards such as Fel Tornadoes and the zone-wide Paraxis. Best to stay inside the main quest hubs when The Paraxis comes around to play. Thankfully, the Antoran Bile Larva is a prolific insect and has many spawn points, so it shouldn't be too difficult to find and capture. The Antoran Bile Larva comes in two color variants, red (pictured above) and green. Additionally, its cousin, the Bile Larva found on Krokuun, uses the same look but includes a third purple color. Both of these Larva share the same moveset, however they have different breeds so take your pick! Last but not least, honorable mention goes to Fossorial Bile Larva, which also uses the same model with a coloring that's a bit more unique than the previous two. This last Larva is not a wild pet and can be trickier to obtain. Be sure to collect this spiky, toothy insect. A spooky holiday just isn't the same without one of the creepiest crawlies out there. In addition to being the creepiest crawly added to WoW yet, the Antoran Bile Larva has some interesting choices as a battler. Its model means it uses Spiked Skin as a defensive spell with some bite, excellent against multi-hitting enemies. Burrow lets the Larva evade some attacks and pulls some big DPS. Plagued Blood also gives the Larva quite a bit of longevity with its on-hit healing debuff, though the Larva doesn’t have the multi-hitting DPS to make the best use of it. Its one DoT, Acidic Goo, helps a bit but you really want several DoTs rolling to make the best use of Plagued Blood. Acidic Goo also adds a small multiplier to damage dealt, making it a good choice based on that alone. Its last two abilities are relatively straightforward. Chomp is a Critter move with slightly higher damage than the Undead Diseased Bite, but both can be used well if you need to counter something particularly spooky! Or, uh, vulnerable to Critter damage, same difference. Altogether, the Antoran Bile Larva makes a good battling addition to any collection. It also makes for a particularly bad one to encounter in the middle of the living room. It's like stepping on a Lego with a jello center. Gross. You don't HAVE to do the opening quests to get here. You just have to be an Engineer.